How dogs are fighting against the Terrorists? Trained dogs have been long been braving the militants. Coupled with their inherent courage and ballistic body armor, the dogs can survive shrapnel and gunfire. Dogs have proved far better than people or machines at quickly finding bombs. Dog helped the US army to capture Osama Bin Laden. The aftershocks of Abbottabad haven’t yet subsided. It was quite a stir that the stealth mission stimulated around the globe. However neither the celebration recognizing the drawing of final curtains on the face of terror nor the controversy simmering over the alienation of Pakistan from the cohort operation has quite faded. Amidst all the media brouhaha, there remains our good old friend ─ the dog who helped Navy Seals in the operation! Well, he is not quite in obscurity anymore. There are articles being written about him in The SUN and The New York Times. 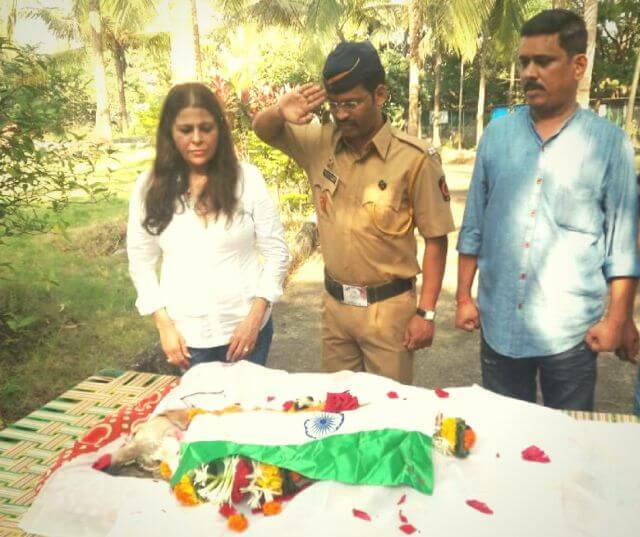 Here’s saluting our comrade for the gutsy galore! During the raid that led to the death of Osama bin Laden, US navy Seals special forces had with them a dog named Cairo, who had undergone the canine equivalent of special services training. He wore a Kevlar vest with harnesses for repelling and parachuting, and a night-vision camera with an 180-degree field of vision. The trained pooches attack anyone carrying a weapon and are now a pivotal part of special operations as they crawl unnoticed into tunnels or rooms to hunt for enemy combatants. The cameras on their heads beam live TV pictures back to the troops, providing them with critical information and warning of ambushes. Closer home in India, the cousins of the special breed canines, which assisted the elite US Navy SEALs in sniffing out Osama bin Laden from his safe haven in Pakistan, will now help Indian security forces in ‘find and fix‘ anti-Naxal operations in dense forests and difficult terrains. See Also: Why no Nobel Peace Prize for Zanjeer, the dog? 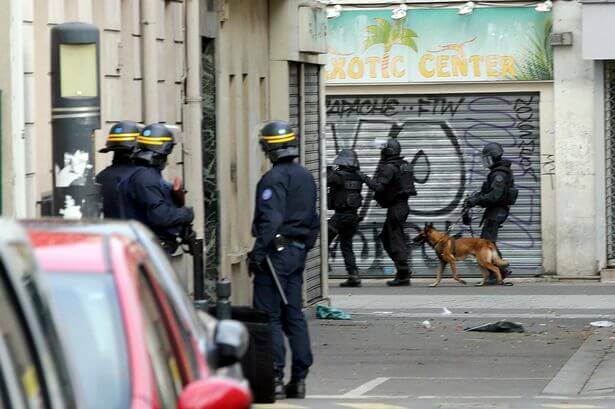 In the recent Paris terrorist attacks, French police dog Diesel lost his life at the Saint-Denis siege after brave act. It is understood the dog was the first to be sent into the apartment where three terrorists were believed to be hiding out. Unconfirmed reports suggested Diesel was killed when a female suicide bomber activated her explosive vest. 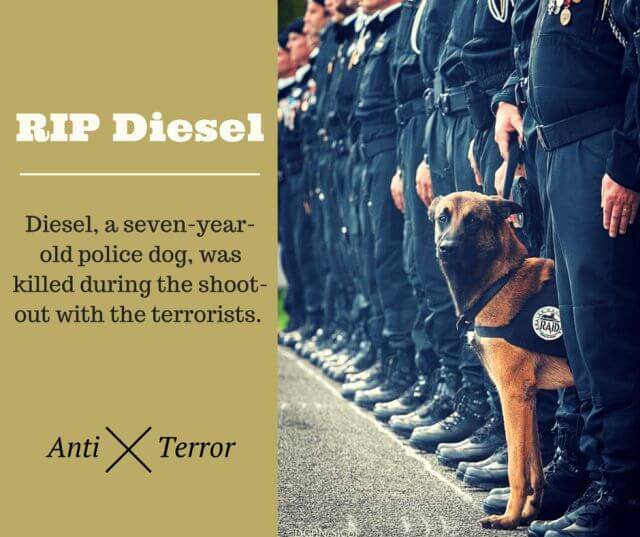 Tributes have come in across the world from people applauding Diesel, the dog’s handler and police for their bravery. And it isn’t all; dogs have always played a pivotal paw in many of such military operations. The operation that led to the capture of Iraqi dictator Saddam Hussain was also aided by the canine support. Personally, I detest having animals involved in the imbroglio but given the state of the world, we can’t trust humans to ward off terror. After their service is done, most dogs are available for adoption. Loyalty is a quintessential canine trait! Goes on to establish (all over again) that dogs are a comrades’ best friend too! “Loyalty is a quintessential canine trait!” I couldn’t agree more. Thanks Deboshree:) Nice to have you back! This couldn’t have been a better tribute for those wonderful marvels who have been and unconditionally continue to be at our sides, irrespective of the magnitude of adversity that they come face to face – more often, the kind that we deliberately intend them to face so that we remain protected, well behind the lines of risk! Thanks for the kind words, Rakesh! Great pictures of outstanding dogs! Pingback: Happy New Year 2012 « Dog with the blog! Hey..hell of a write. Adore your K9 inclination. Just another minor add on, dogs are the best explosive detection ‘mechanism’ available with a success rate of 96 %. 30 % over the next credible source of detection. Its an interesting insight that you have provided- steering over technology,the sensitivity of canine nostrils is simply amazing! What i actually feel n belive is we humans are on earth to save the animals, but after learning this fact that we the humans rely upon the animals in most of the ways..I really wish the Almighty must change the natural thought of humans “pity for animals” to “love & respect for animals”. I wish the rest of humans get awakened by the civic sense of not abusing the animals specially the stray dogs,as they suffer a lot. Previous Previous post: Knut, the world’s most famous polar bear!